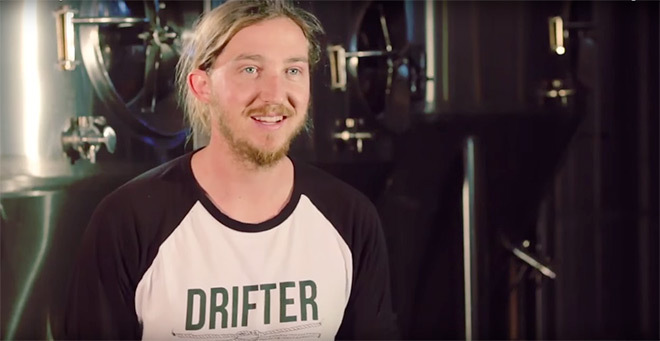 Our brewer of the month for May is none other than Drifter Brewing Company, with Nick Bush at the hoppy helm. We caught up with him on an island under a palm tree to chat about what inspires his beer brewing technique and his beer drinking ethos. Well, not quite, but drinking these beers that’s where you’ll feel you are. Ships’ wheels, maps, compasses, coconuts…Would you call yourself a Craft Beer Pirate? You clearly love the ocean, any plans to feature it in a beer? Your coconut ale has pretty much a cult following. Did you develop the recipe in a hammock, with some reggae in the background? ​Mozambique is the main reason for trying out this beer. I used to head up to that tropical paradise a couple times a year. There are so many coconut trees everywhere and ​I love coconut and ​I love beer, ​so ​why not try them together! The ​actual ​recipe development happened in Cape Town though. What tunes are playing while you’re brewing? We’ve got a record player so we usually spin vinyls throughout the day. Our favourite record in ​the collection currently is from The Drifters (aptly named) who play fun, soulful 60s music. Otherwise, Kenneth (who helps at the brewery) puts on his upbeat Malawian music. If you were stuck on a desert island with a case of coconut ale, what would be your last meal? Your other beer is a lager, tell us a bit about it. Does it pair well with biltong and droewors? What doesn’t pair well with biltong and droewors?! ​Though this may be biased, the Legend Lager is my favourite beer right now. It’s light yet still very flavourful and great with a snack like biltong. Do you remember your first beer? Was there one beer that changed your life? I wouldn’t say one beer changed my life, but one trip did…to Portland, Oregon. I visited my other half, Anna, in December of 2012 and she signed us up to volunteer at a Winter Ale Festival. This is a festival where ​each brewery can only submit one specialty beer to have on tap. They were all unique porters, stouts, sours and barrel-aged brews and not a single one was under 7% ABV. It just blew my mind how different the beer scene was from South Africa. Breweries were pushing the limits and not afraid to take chances. I’m not going to lie, some of the beers at that festival weren’t my favourite, but they were interesting! I think it’s important as a brewery to make two types of beers: ones for everyday easy drinking that appeal to the masses, and ones that push people out of their comfort zones. We often get people who say, “I don’t normally like IPAs but I like yours.” We need to keep reminding people that these beer categories are so vast and to not immediately discard a certain style after trying one particular beer. They say behind every good man, is a good… beer! And in this case a good woman. You two make a great team! ​Whew, what would I do without my Anna Banana?! She works a full time job during the day and then does work for Drifter in the evenings and on weekends, and truly is the reason the brewery has gained momentum in this past year. We make a great team because our skill sets really complement each other. This isn’t our first rodeo though! In 2014, we worked on a boat together as captain and stewardess. You guys were responsible for Cape Town’s most popular underground beer festival (literally, a parking lot) Woodstock Winter Fest. Any plans to top that in 2016? Haha! That was such a great day! The Woodstock Winter Beer Festival was actually inspired by the one in Oregon we volunteered at. 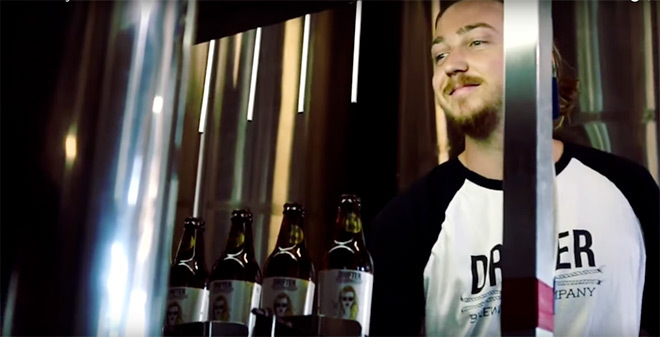 Most breweries in South Africa do light beers and lagers and we wanted to have a festival that featured the dark and delicious brews that we all like to experiment with. Little did we know, how many people would also dig this! This year has proven to be a crazy busy one and our friends at Riot recently hosted the Woodstock Autumn Festival, so we will bring back the winter one again in 2017! In the meantime, we are focusing on smaller events at the brewery. We just did a Mussel and Beer Banquet and we’re looking at another similar event in June. And we will be doing our annual Santa Brewery Crawl in December. You guys clearly aren’t scared to experiment a little (peanut butter, margarita ​ topped beer). Any new surprises on the cards? We are taking a trip to Oregon and Alaska in June and we’ll be doing a lot of small batch experiment brewing with friends there, so we should have some more fun stuff coming up! We also want to bring back an old recipe for a ginger infused weiss beer as well as a Berliner weiss. The peanut butter porter will make a come back again for the Woodstock Winter Beer Festival, as well as our smoked porter. Stay tuned! Last, what would you like the people to get from your beers in the Monthly Mixed Case? We want people to see the two examples of our beers that I was talking about earlier. The Legend Lager is the easy drinking beer that appeals to the masses and the Stranded Coconut is the one that may stretch some people’s comfort zones. Both are delicious so we mainly just want people to enjoy them! We have also just launched our own mixed four-pack which is called our Explorer Pack, for people to explore our range of beers. This includes The Cape Town Blonde, Legend Lager, Scallywag IPA and Stranded Coconut. More to come on this! To get a taste of Drifter craft beer, get your hand’s on our Mixed Case this month or get a case of Drifter to stock up the bar fridge.